Pooles of Alsagers Bank (on the outskirts of the Potteries) ran a stage service from their home village to Newcastle under Lyme. One of their fleet was 9513 RF which is almost identical to the ex Sheffield Leopard shown on the site with Stevensons of Spath. Pooles bought 9513 RF new and its Burlingham body (no7064) must have been built at the same time as the Sheffield batch (two of which had body numbers 7061 and 7062) – this information from ‘Bus Lists on the Web’. As per my post for Leopard fanfare 1002. The original batch were first intended as PSUC1 specials before being announced as L1 Leopards. I never saw them with Tiger Cub badges – but maybe these were removed and replaced after the official launch of the Leopard in November 1959. B43F? The seats look like coach or DP seats to me. One other strange thing about this vehicle is that it was the only Poole’s service bus never to receive a fleet number. Those before it did, and so did those which came afterwards, right up to the family selling the business to the haulage contractor who drove it into the ground. Does anybody know why it didn’t merit a fleet number? It is usual, if a vehicle is given a fleet number, for the number to be visible on the vehicle. As we see in the illustration, there does not appear to be one, however. Is it, perhaps, on the nearside or the back, or is it just for administrative purposes? Is Neville right to say it never received one? I’m supposing you mean not at all, not nohow even on paper, young sir! To my mind – or what’s left of it after a career in Local Government – the fact we don’t see one suggests very strongly that "not nohow" is correct. I walked around this vehicle on numerous occasions and also studied its interior, and I can confirm that it carried no fleet number, at least until mid 1972 when I last saw it. I think the mistake (in listing it as fleet number 9) may originate in PSV Circle publication 2PD7, covering Staffordshire independents, where it is so listed. The compilers seem not to have noticed that Pooles were operating a genuine fleet number 9, Tiger Cub/Seagull coach 938 CRE, from 1954 to 1968 which overlaps with the first eight years of 9513 RF’s stay in the fleet! Having said that, it wouldn’t be unknown for an independent to operate two vehicles with the same fleet number at the same time, but in the absence of any photographic evidence I’m sticking by my original assertion. I am forced to eat humble pie however, as I’ve just noticed in my own records that Poole’s Reliance/Park Royal bus 4399 E (delivered the year before 9513 RF) also failed to acquire a fleet number throughout its career with the operator. It seems that Pooles temporarily abandoned allocating fleet numbers in 1958-59 and then started again in 1960 without giving numbers to the two recently delivered service buses. Perhaps somebody else was in charge for those two years who considered fleet numbers to be a "big fleet" affectation! Also meant to add that I agree it should be classified as a dual-purpose vehicle – the seats were of a higher standard than those on North Western’s contemporary "black top" saloons and comparable to those on North Western’s Reliance/Alexander Z types which NWRCC listed as coaches rather than "semi-coaches" on their internal fleet listings. In honesty it should be said that 2PD7 is not one of the PSV Circle’s most accurate publications, but in the absence of anything better was still used as a source for most of the enthusiast publications (Capital, AM Witton Fleetbooks etc) of the ’70s and ’80s. I’ve seen many of its known errors copied elsewhere over the years, so presumably Bus Lists took their data (ie B43F) from these sources. As I’ve said before on this site, the PSV Circle do a marvellous job but any enthusiast who takes every word in their publications as "gospel" is slightly deluded. Everybody makes mistakes and they only get corrected if people point them out… and sometimes not even then! Needless to say, if anyone spots any errors in my books, please feel free to air them on this site. I’d rather know than not know – it’s the only way we end up with better history. Oh Dear!! I’ve just been looking through a copy of my own book "Independent Buses in Staffordshire" and I’ve noticed that the caption to a photograph of 9513 RF describes it as fleet number 9. Whoops. In my defence I didn’t write the caption (the original photographer presumably used 2PD7 as a reference), but on the other hand I should have picked it up when adding the details to the captions typescript or at the proof-reading stage. As I said above, "everybody makes mistakes", but I didn’t expect to be pointing out one of my own. 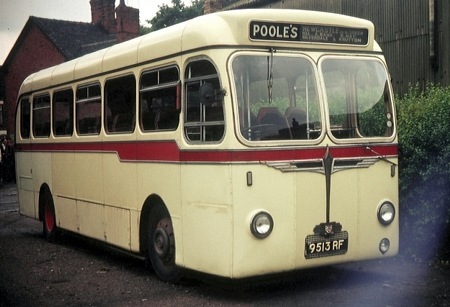 I would just like to add to the info on Pooles bus 9513 RF, I have been researching Pooles for a number of years and have now approx 300 Pooles bus and coach pics in my collection, and can confirm that 9513 RF DID carry a fleet number of 9 positioned each side of the front of the bus just below the sidelights, and I have a photo to show this, the other buses of Pooles to carry fleet number 9 were – 938 CRE, and XFA 967S, of which I also have pics to confirm, The buses purchased during 1958-59, and some later buses and coaches, did not seem to carry fleet numbers,. If I can be of any more assistance please get in touch, and any more info or pics to help me in my research would be most welcome, many thanks. Thanks for that info, Dave G, now I wonder if you can date the photograph which shows the fleet number? What I’m getting at is, did 9513 RF become number 9 after the disposal of the Seagull which carried that number in 1968? I’ve seen around a dozen decent quality shots of the vehicle over the years, none of them with it carrying fleet numbers in the position you describe, but it could be that all of these were taken prior to 1968. My personal visits to the operator (and to the N-u-L terminus) were concentrated in the years 1965-68 although I did see their vehicles in passing between 1968 and 1972 on sporadic visits to the area. By then however I had begun to devote more time to girls and less to buses! The photos I have showing the fleet number I’m afraid have no dates on them, but seem to be early pics in black and white, I have other colour pics that do not show a fleet number. Pooles still owned this bus in March 1978. Two older Pooles buses also had fleet number 9, ORE 676, a Foden of 1947 vintage, and JVT 52, a 1945 Bedford. I am hoping to one day produce a book about Pooles when I have enough information. Also I have a collection of the old Duggins/Princess buses pics that shared the same routes as Pooles.